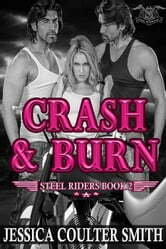 Crash and Burn, tiger shifter twins, patched into the Steel Riders M.C. when they were twenty. It's been a fun life filled with women and booze, and maybe the occasional joint, but all parties must come to an end eventually. When a woman betrays the club, and the trail leads to the Double Deuces, it's time to exact some revenge.